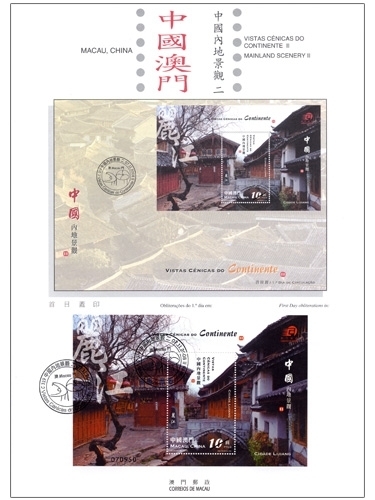 Following the first series of souvenir sheet “Mainland Scenery” with the landscape of Mount Kangrinboqe issued on 2007, the second series will be issued on 7th November, 2008 displaying the beautiful landscape of the Old Town of Lijiang. It is situated within Naxi Autonomous County of Lijiang City, Yunnam Province in Southwestern China and is also the National Historical Old City. The Old Town is surrounded by mountains and lakes, the characteristic bridges become a major part of the scenery. 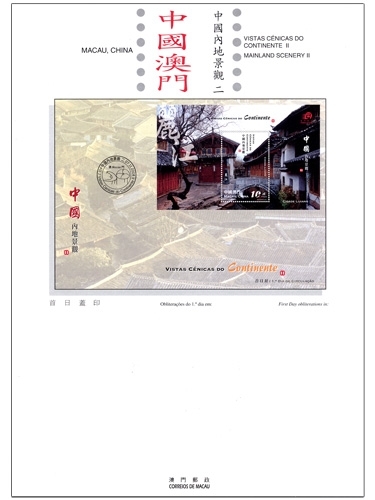 The arch stone bridge shown on the souvenir sheet is located at the entrance of the Baisuifang Alley and named as Long-Life Bridge, it is to commemorate a family in which both the father and the son with long life. 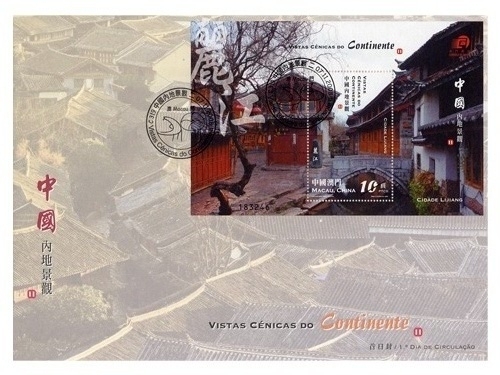 The design shown on the commemorative postmark represents the Sun and the Moon of Dongba hieroglyph, it symbolizes the virtuous work carried out by the Nakhi women. 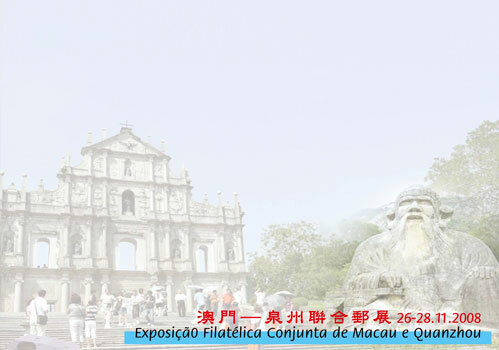 The image captured for this souvenir sheet and the author for the information brochure are came from the veteran photographer of Macao Mr. Lou Kam Ieng. 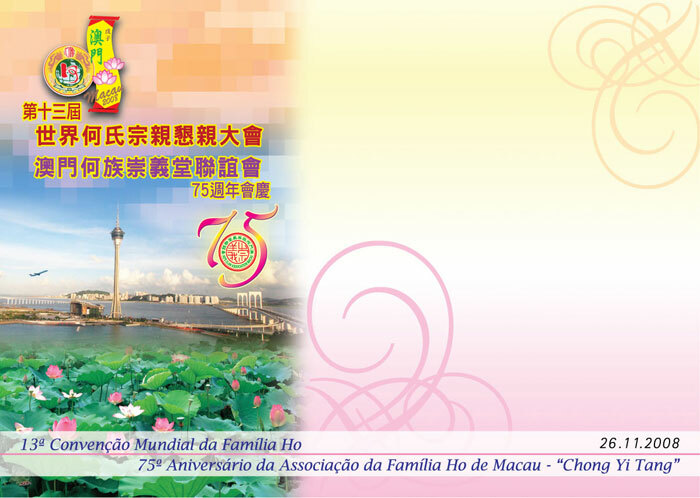 The composition of the souvenir sheet is designed by Macao Post. This is the tenth issue in 2008. 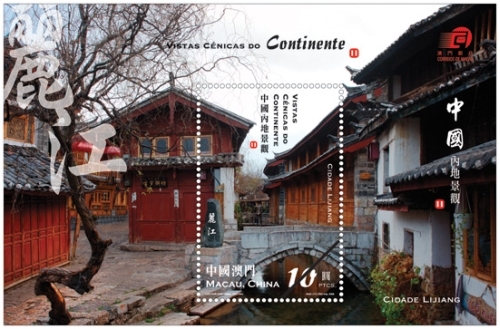 The issued stamps are as “Lunar Year of the Rat” on 23/01/2008; “I Ching, Pa Kua VI” on 01/03/2008; “Beijing 2008 Olympic Torch Relay” on 03/05/2008; “Legends and Myths VIII” on 02/06/2008; “Local Delights” on 04/07/2008; “World Heritage” on 31/07/2008; “The Opening of the Beijing 2008 Olympic Games” on 08/08/2008; “20th Macau International Fireworks Display Contest” on 01/10/2008 and “Celebration” on 09/10/2008. 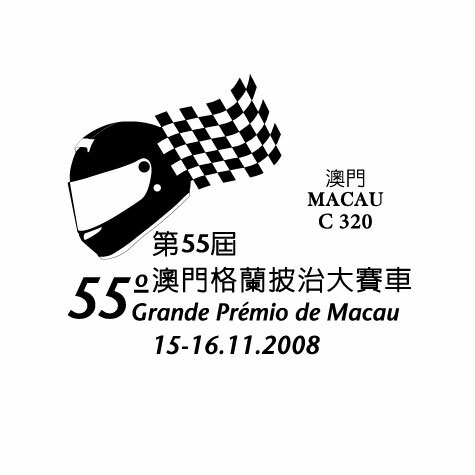 To celebrate the 55th Macau Grand Prix, Macao Post announced that a Temporary Post Counter will be set up behind the Lisboa Stand (Restriction area for ticket entry) and the Philately Shop of Macao Post Headquarters on 15th and 16th November 2008 providing the commemorative postmark cancellation service for the “55th Macau Grand Prix”. 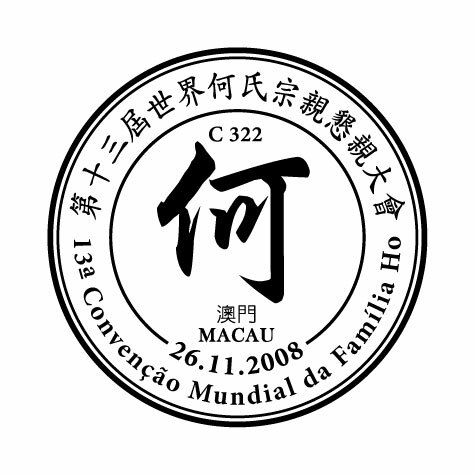 To commemorate the 13th World Convention of the Ho Family, Macao Post announced that a Temporary Post Counter will be set up at our Philately Shop located at Macao Post Headquarters at 09H00 to 17H30 on 26th November 2008 providing the commemorative postmark cancellation service for the “13th World Convention of the Ho Family”. 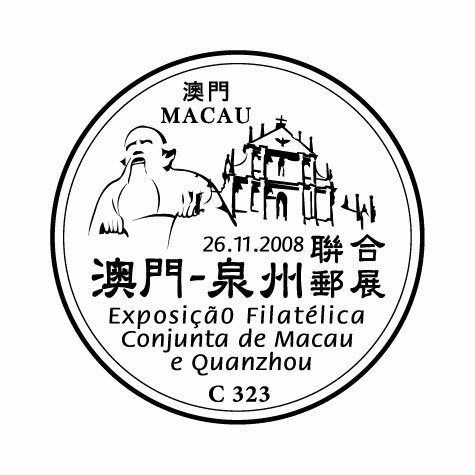 To cope with the “Macao – Quanzhou Joint Stamp Exhibition”, Macao Post announced that a Temporary Post Counter will be set up at the UNESCO Centre of Macao – Multifunctional Room at 10H00 to 19H00 on 26th November 2008 providing the commemorative cancellation service for the “Macao – Quanzhou Joint Stamp Exhibition”. 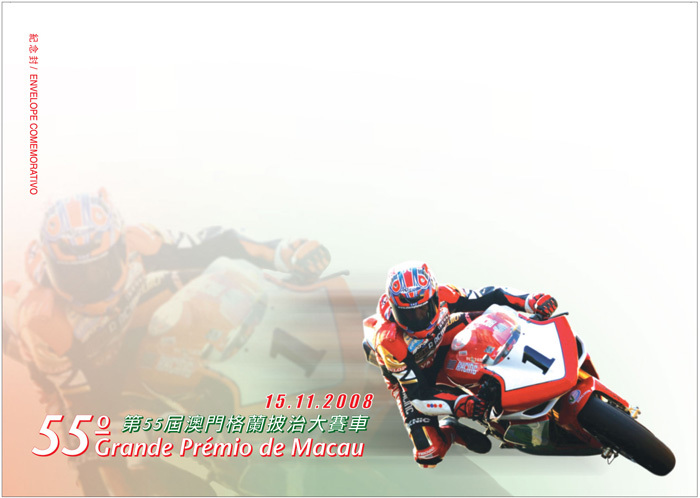 To celebrate the Listing of SJM Holdings in Hong Kong, Macao Post announced that a Temporary Post Counter will be set up at the Hotel Lisboa – Lisboa Bend Entrance at 10H00 to 17H00 on 25th November 2008 providing the commemorative postmark cancellation service for the “Celebration on the Listing of SJM Holdings in Hong Kong”. 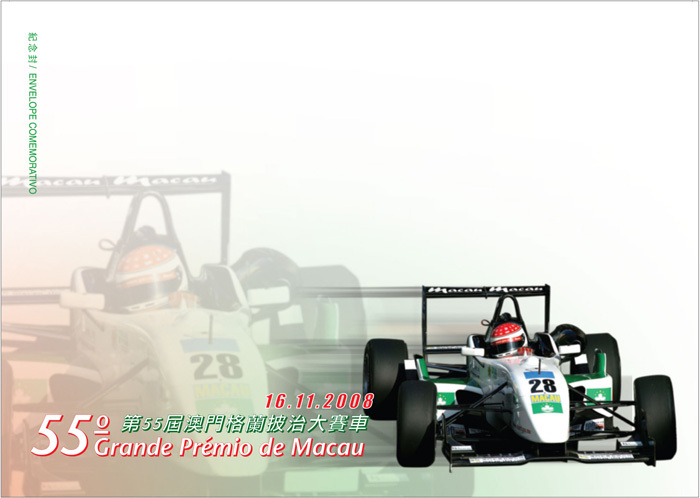 To celebrate the 38th Anniversary of Hotel Lisboa, Macao Post announced that a Temporary Post Counter will be set up at the Hotel Lisboa – Lisboa Bend Entrance at 10H00 to 17H00 on 25th November 2008 providing the commemorative postmark cancellation service for the “38th Anniversary of Hotel Lisboa”. 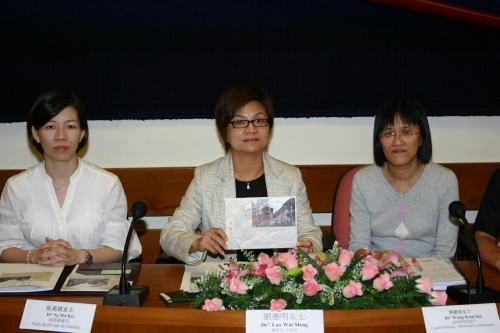 Two designs of commemorative envelopes will be distributed to public, and various philatelic products will also be available for sale during the above activity.